The accessories and fixtures are usually dark wood or dark colors; this can be the laundry baskets, toilet roll and towel storage. 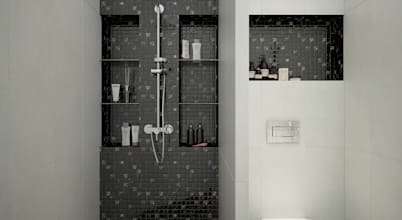 Also, the towel and washcloth hangers can be of a dark black shade if you choose, creating uniformity throughout the bathroom. The mirror frame and light fixtures can be of a different color such as silver or bronzy-gold if that suits your style. Even if you choose to add touches of white, you may do so by all means, just as long as the theme of greyscale is present and consistent throughout.